As I continue my journey into the world of Wes Craven, I’m starting to understand why I missed some of these. Granted, Deadly Blessing, while a slow burn, was entertaining enough for what it was. That said, I ended up grabbing the Swamp Thing Blu-ray from Scream Factory because I always hear how awesome their releases are, and I’d heard some good things about it in the past. After the first twenty minutes or so, it dawned on me that I’d actually seen parts of this film on TV as a kid, but it never really drew me in, nor did it stick with me at all. At first glance, this is surprising because Swamp Thing has everything I’d want in a movie, especially as a little kid: doctors, monsters, guns, and a swamp. Yet, even then, I didn’t give two shits about it. And now, as an adult, I can say that I’m even more disappointed because I wasted $13 on this movie. Dr. Alec Holland, hidden away in the depths of a murky swamp, is trying to create a new species, a combination of animal and plant, capable of adapting and thriving in the harshest of conditions. Unfortunately, he becomes the subject of his own experiment, and is transformed into a monster. Ray Wise plays Dr. Holland, and while he’s good in the role, everything is rather flat and predictable. None of the actors really stand out to me. Not even Adrienne Barbeau, whom I recognized from a few other ’80s horror films (mainly John Carpenter’s The Fog). 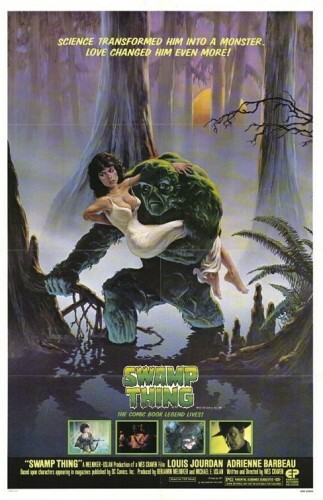 The biggest problem with Swamp Thing is that its source material isn’t that good, and despite me bashing the Marvel Cinematic Universe, this origin story falls flat in comparison to those. I know that isn’t exactly fair, but not something I can change, sadly. It’s not all bad here, though. While I didn’t enjoy the plot or characters, there are some fantastic scenes mixed in. The best scene, in my opinion, is when someone catches on fire and we see them running through the set, outside the house, and so on. I can’t even imagine the planning of this stunt, and it looks amazing. In fact, it’s one of the only scenes that sticks out. Oddly enough it happens early in the film, and I was let down that nothing else in the film lived up to the same level of this stunt. 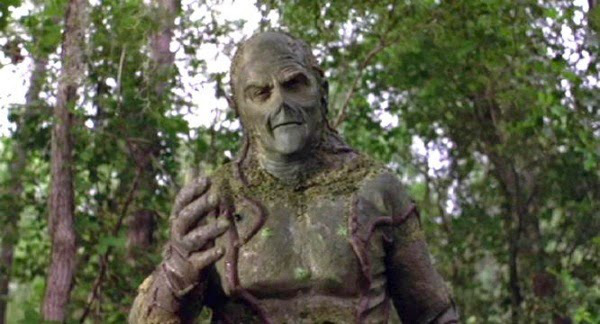 While CGI wasn’t being used back in the ’80s, the practical effects, which I typically love, are just terrible in Swamp Thing. The long shots look great, but any time we get close to the Swamp Thing, it just looks like a reject from Face/Off, which is a shame. There is a cool body bag-like thing near the end of the film that looks fantastic from a distance, and then just terrible up close. While Deadly Blessing was a surprise, Swamp Thing is a let down, and I think that’s because it’s so different than the other Wes Craven films I’ve seen. The plot is pretty basic (written by Craven), and while there are some great shots, and the Blu-ray transfer looks fantastic and clean, it doesn’t exactly feel like a Craven film. I almost wish the Blu-ray wasn’t so crisp, as the grain might have added to the film (or I could just be drunk). Swamp Thing took me three days to get through because I just wasn’t feeling it at all, and I think that’s all you need to know about this movie. 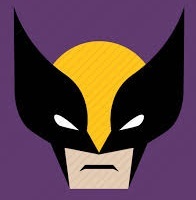 Chris was raised on horror films, which gave him a deep love for the genre, especially its most quirky and offbeat titles (like A Nightmare on Elm Street 2). This love quickly turned into an obsession for cinema in 1997, when he decided he needed to see every major theatrical release. Video games (JRPGs), reading (anything but fantasy), and reality television (Survivor) are just some of his other passions. He’s been with Cinefessions since 2013, and has been writing reviews all over the internet for the past twelve years.